Is Online Streaming of NFL RedZone On the Way? To watch NFL RedZone, is to love NFL RedZone. Not everyone, however, is willing to shell out the extra bucks for additional cable and satellite tiers when their monthly bills are already sky high. Plus, more and more households are “cutting the cord” with their TV providers and turning to online options like Netflix, Hulu, and others. The NFL already offers a handful of online streaming products like NFL Game Rewind, Audio Pass, and Preseason Live which are all well executed, top quality products. So, will NFL RedZone be the NFL’s next online offering? I couldn’t help but notice this graphic on the NFL RedZone website. There is no additional information other than a simple coming soon message. The NFL does have some online streaming products that they offer only outside U.S. and Mexico, such as NFL Game Pass and NFL Network, so it’s entirely possible that this won’t be available in the US. If it is, and is reasonably priced, I can’t image it not being a huge seller. You can actually get the NFL RedZone online now if you subscribe to NFL Sunday Ticket To-Go, but that requires shelling out the top shelf price of $350. Plus, reviews of the service have been very negative. 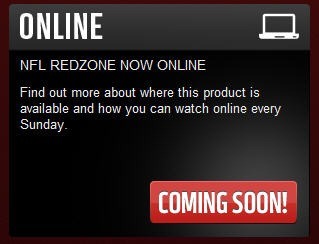 UPDATED (7/28/2012) – The “Coming Soon” banner has been removed from the RedZone website, but I noticed another potential indication of future online Redzone product this past week. 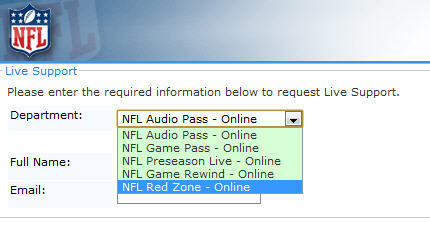 I jumped onto the NFL Live Support chat to to fire off a few questions about my account when I noticed a support option for NFL Red Zone – Online. Naturally, I jumped on and asked about the availability, but was told that the product was “not currently available.” When I asked when or if it might be available I was told “Sorry, I don’t have any further information.” Bummer, but I’m not surprised that tech support either wouldn’t be in the loop or wouldn’t be authorized to disclose it if they were. For now, I guess we keep waiting. Would you purchase NFL Red Zone online? If so, how much would you pay for the entire season? $50? $40? $30? More? Less?